It's done!! Last week, I finished up hand stitching the binding of the Arkansas Traveler quilt. I am in love with how it turned out. A little backstory on this quilt...my aunt asked me to make something for my cousin and his wife who were married late last year. The design and colors were all left up to me (yes!) 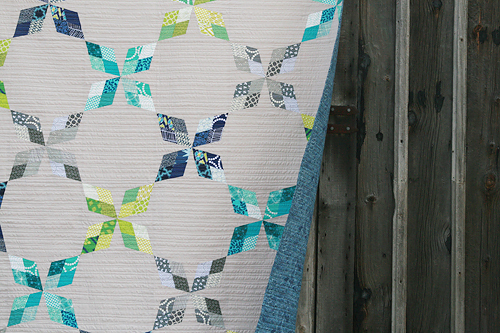 I have loved the Arkansas Traveler block ever since we made them in the Summer Sampler Series. 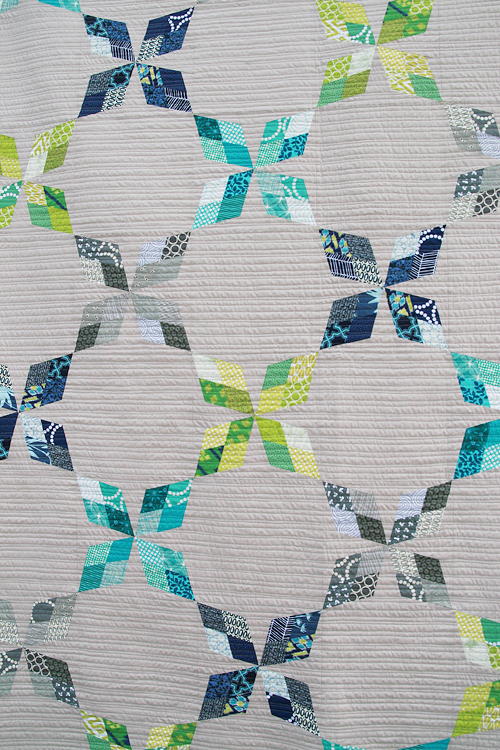 They are a bit of work with the diamonds and the paper piecing, but they are just beautiful blocks. 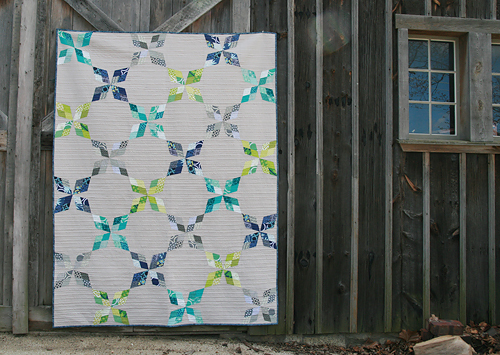 When I was brainstorming layout ideas, I was inspired by the fact that this quilt was for a newly married couple, so symbolizing the bond of marriage was important to me. 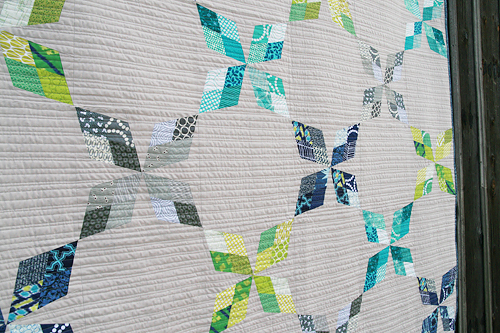 This layout is a nod to more traditional wedding quilts like a Double Wedding Ring or Irish Chain. Measuring 72" x 96", I'm not sure if this is the largest quilt I've ever made, but it is close. It's definitely the heaviest. 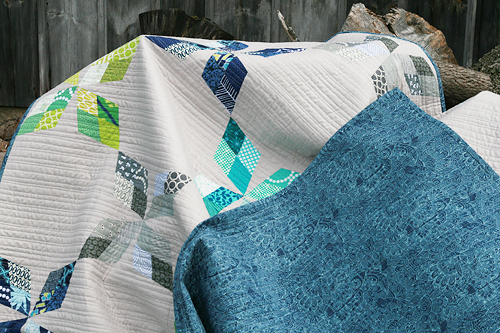 Usually I use Quilter's Dream Request Loft batting (the lowest loft), but for this one I used a slightly loftier batting, the Select Loft. The quilt is headed to Montana and I figured it was colder there so a thicker quilt would be nice. The size and weight did make for a challenge when quilting. There were more than a few moments when I wondered if I should have sent it out to a long arm. I stitched horizontal lines, spaced randomly between 1/4" and 3/4" apart. I went through 12 bobbins and each of the 8 rows of blocks took about 1 hour, 15 minutes. 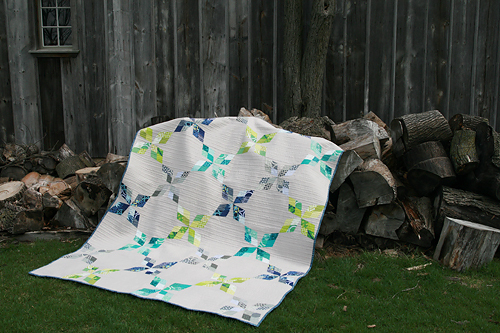 I tried to quilt 2 rows each day. It was quite a workout! The diamonds are all scrappy fabrics from my stash, but the neutral is Free Spirit Designer Solid in Sand Dune and the backing and binding is Submarines and Seaweed in Aqua from Tula Pink's Saltwater line. I'm heading to ship it out today. It's hard to say goodbye but I'm really happy to have created something special for someone in my family.